Manufacturing activity in India slackened in October as new orders stagnated in the wake of subdued demand conditions, largely due to “negative impacts“ of GST. 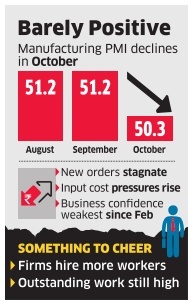 The Nikkei India Manufacturing Purchasing Managers' Index fell to 50.3 in October, from 51.2 in September, indicating a “broad stagnation“ in the manufacturing sector. This is for the third consecutive month that the index has come in above 50 that separates expansion from contraction. 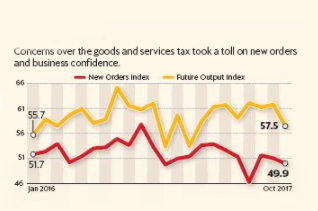 The decline in manufacturing activity was mostly because of stagnation in new business as “negative impacts“ of GST led to subdued demand conditions. Moreover, new export orders dropped at the fastest pace since September 2013. The silver lining, however, is firms added to their payroll numbers at a similar pace to that of September in response to greater volumes of outstanding business. Meanwhile, the level of business confidence eased to the weakest since February.